Since, the given matrix is an upper triangular one, all eigen values are A. And hence A - λI = A. What x1, x2, x3 are suitable? 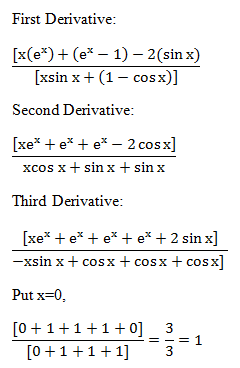 Since α is not equal to zero, so x3 must be necessarily zero to get zero vector. Hence, only (B) and (D) satisfies. In this DE, degree is 1 then this represent linear equation. 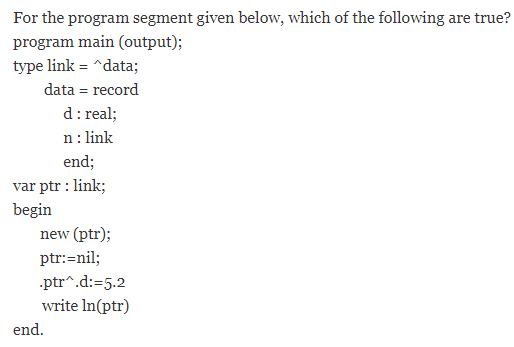 Which of the following is (are) valid FORTRAN 77 statement(s)? 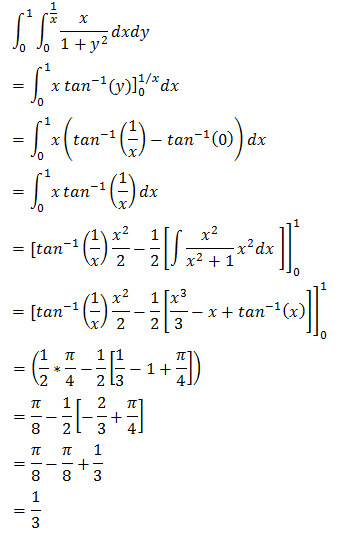 Which of the following improper integrals is (are) convergent? Since the given expression is in 0/0 form, so we can apply L-Hospital rule. 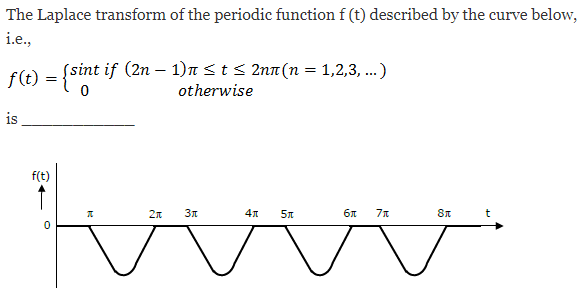 Characteristic equation is λ4-1 = 0. 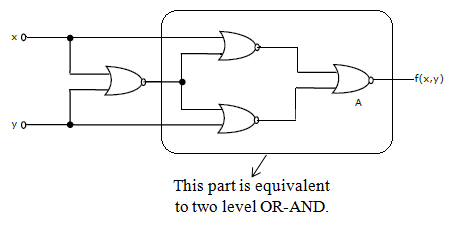 Circuit behaves as shift register and mod-6 counter. 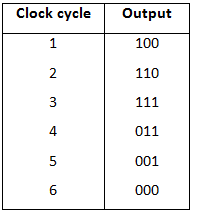 Note that this is the Johnson counter which is the application of shift register. And Johnson counter is mod-2N counter. Since, it is asked for transmitted characters we take floor and answer is 218. Writing the mods result in reverse order gives (45E)H.
A ROM is used to store the Truth table for a binary multiple unit that will multiply two 4-bit numbers. 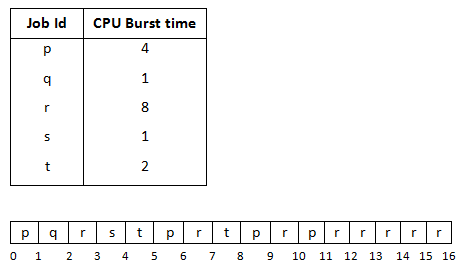 The size of the ROM (number of words × number of bits) that is required to accommodate the Truth table is M words × N bits. 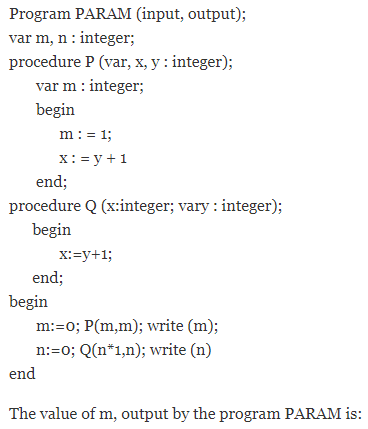 Write the values of M and N.
Input will consist of 8 bit (two 4-bit numbers) = 28 address. Output will be of 8 bits. So memory will be of 28 × 8. So, M = 256, N = 8. So, in DOS, the disk rotates 2400 times. 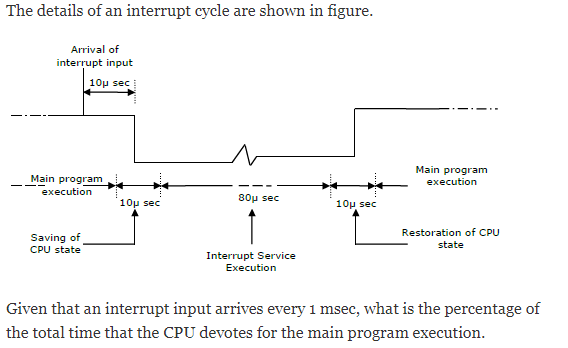 For every 1ms an interrupt occurs which is served for 100 μs. Thus, for every 1000μs, (1000 - 100) = 900 μs of main program and 100μs of interrupt overhead exists. Thus, 900/1000 is usage of CPU to execute main program . 0, because global m is not modified, m is just passed to formal argument of P.
0, because n is the actual parameter corresponding to x in procedure Q. 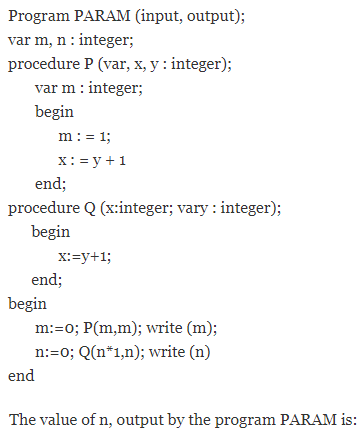 0, because n is the actual parameter to y in procedure Q. 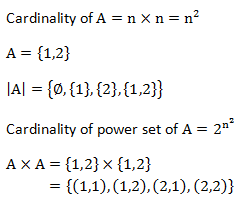 1, because n is the actual parameter corresponding to x in procedure Q. 1, because n is the actual parameter corresponding to y in procedure Q. 0, because n is just passed to formal parameters of Q and no modification in global n.
Since m is defined global it is visible inside all the procedures. It allocates space for the literals. It builds the symbol table for the symbols and their values. It generates code for all the load and store register instructions. 1) Assign address to all statements in the program. 2) Save the values assigned to all tables for use in pass 2. 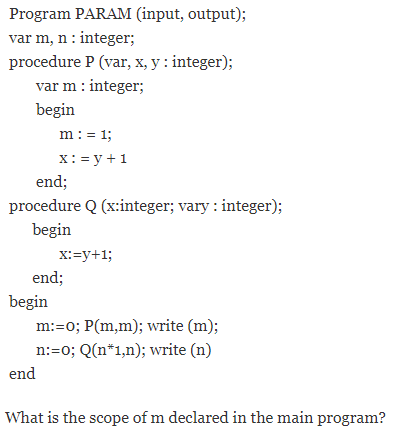 3) Perform some processing of assembler directives. In a program the loader that can loads the object of the program from secondary memory into the main memory to execute the corresponding program. Then the loader is to be resides in the main memory. Root directory can points to the various user directories. Then they will be stored in a way that user can't be easily modify them. Then they should be at fixed location on the disk. Consider a system having m resources of the same type. These resources are shared by 3 processes A, B and C, which have peak demands of 3, 4 and 6 respectively. For what value of m deadlock will not occur? → If A have 2, B have 3, C have 5 then deadlock will occur i.e., 2+3+5=10. → If we have one extra resource then deadlock will not occur i.e., 10+1=11. → If we have equal (or) more than 11 resources then deadlock will never occur. p is departure at 11. Consider a simple connected graph G with n vertices and n-edges (n>2). Then, which of the following statements are true? The graph obtained by removing any edge from G is not connected. G has at least one cycle. The graph obtained by removing any two edges from G is not connected. If a graph have n vertices and n edges (n>2) then it is to be cyclic graph. Then it have atleast one cycle and if we remove two edges then it is not connected. Given sets are finite union of sets. One set must be infinite to make whole thing to be infinite. 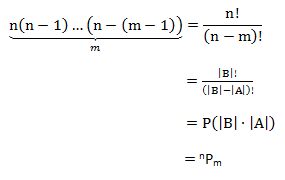 A one-one function 'f' assigns each element ai of A a distinct element, bj=f(ai) of Bi for a, there are n choices, for a2 there are n-1 choices, for am there are (n-(m-1)) choices. ⇒ In this 'n' is constant. So, n is added to n times itself which is O(n2). Hence, (a) is wrong. 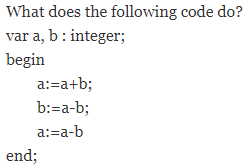 And rest (B), (C), (D), (E) are correct. There are 43 questions to complete.